What Are Symptoms and Signs of a Ganglion Cyst? When Should Someone Seek Medical Care for a Ganglion Cyst? What Exams and Tests to Health-Care Professionals Use to Diagnose a Ganglion Cyst? What Is the Treatment for a Ganglion Cyst? What Are Home Remedies for Ganglion Cysts? Is Surgery Effective for Ganglion Cyst Removal? What Types of Doctors Treat Ganglion Cysts? Is Follow-Up Necessary After Receiving Treatment for a Ganglion Cyst? Is It Possible to Prevent Ganglion Cysts? What Is the Prognosis of a Ganglion Cyst? A ganglion cyst is a tumor or swelling (benign, not cancerous) usually on top of a joint or the covering of a tendon (tissue that connects muscle to bone). It looks like a sac of liquid (cyst) located just under the skin. Inside the cyst is a thick, sticky, clear, colorless, jellylike material. Depending on the size, cysts may feel firm or spongy. One large cyst or many smaller ones may develop. Multiple small cysts can give the appearance of more than one cyst, but a common stalk within the deeper tissue usually connects them. This type of cyst is not harmful and accounts for about half of all soft-tissue tumors of the hand. Ganglion cysts, also known as Bible cysts, are more common (three times more) in women than in men, and a majority occur in people between 20-40 years of age. Rarely, ganglion cysts can occur in children younger than 10 years of age. The cause of ganglion cysts is not known. One theory suggests that trauma causes the tissue of the joint to break down forming small cysts, which then join into a larger, more obvious mass. The most likely theory involves a flaw in the joint capsule or tendon covering (sheath) that allows the joint connective tissue to bulge out. Chronic damage may cause cells to produce mucin and fluid. The ganglion cyst usually appears as a bump (mass) that changes size. It is usually soft, anywhere from 1-3 cm in diameter (about .4-1.2 inches) and doesn't move. The swelling may appear over time or appear suddenly, may get smaller in size, and may even go away, only to come back at another time. Most ganglion cysts cause some degree of pain, usually following acute or repetitive trauma, but many are without symptoms, except for their appearance. The pain is usually nonstop, aching, and made worse by joint motion. When the cyst is connected to a tendon, one may feel a sense of weakness in the affected finger. A ganglion cyst can benefit from medical evaluation whether or not there are symptoms. A doctor can be sure that you have a ganglion cyst, keep you from worrying, and help decide on the best treatment plan for you. A ganglion cyst does not need to have emergency treatment unless one has significant trauma. A routine check by either a primary doctor or a specialist in bones and joints (an orthopedist) usually can result in both diagnosis and treatment of many ganglion cysts. A physical exam is often all that is needed to diagnose a ganglion cyst. Most ganglion cysts transilluminate (allow a bright light to pass through it). A doctor may get further confirmation by using a syringe to draw out some of the fluid in the cyst (needle aspiration) or ultrasound. Ultrasound is an imaging procedure involving the use of sound waves, and this can to help evaluate the bump to see if it is fluid-filled (cystic) or solid. Ultrasound can also detect whether there is an artery or blood vessel causing the lump. Advantages of ultrasound detection include the fact that it is becoming more widely available, it's quick, relatively inexpensive, and is a reliable imaging mode. X-rays have very little use in ganglion diagnosis unless a fracture or underlying bone problem is suspected. A doctor may send one to a hand surgeon if the bump is solid or involves a blood vessel (artery). Magnetic resonance imaging (MRI) is used to see the wrist and is very useful for diagnosis of ganglion cysts. One drawback to this diagnostic method is the cost of the procedure. Many ganglion cysts can disappear without any treatment at all. Various treatments have been proposed over the years. Some include observation of cysts without symptoms, using a needle to remove the cyst's contents (aspiration), or surgery. Aspiration usually includes placing a needle into the cyst, drawing the liquid material out, injecting a steroid compound (which acts as an anti-inflammatory agent). 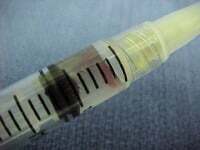 Studies have shown a majority of people are cured after having the fluid drawn out with a needle one time. If you have the fluid drawn out three times, your possibility of being cured is even higher, particularly with a cyst on the back of the hand. If you compare aspiration/injection and surgical removal, in general, cysts return less often after surgery. Other therapy has been attempted (corticosteroids, manual compression, electroacupuncture, for example), but one should discuss such treatments with a doctor before being attempted, since the outcomes vary. In the past, home care has included topical plaster, heat, ice packs, and various poultices. It even extended to use of a heavy book to physically smash the cyst (sometimes this is called "Bible therapy" or cyst popping). These forms of treatment are no longer suggested, however, because they have not been shown to keep the ganglion cysts from returning and could, in fact, cause further injury. Ganglion cysts are the second most common elective referral to a surgeon, carpal tunnel being the first. Surgical removal of the cyst is needed when the mass is painful, interferes with function (especially when the dominant hand is involved), or causes numbness or tingling of the hand or fingers. Surgery can involve simple removal of the cysts through a small incision in which a camera (arthroscope) is inserted to view the area or through a larger incision allowing the cysts and surrounding area to be seen directly. Arthroscopic surgery is becoming more common because of the smaller resultant scar and shorter healing times from the smaller incision. The types of doctors that may treat ganglion cysts vary according to the cyst location and the individual's symptoms. Many individuals can be treated by their primary-care doctor; others may need treatment by an orthopedist or hand surgeon. After you have been diagnosed with a ganglion cyst and have chosen to have treatment, follow-up will be different based on what you have chosen to do. After simple aspiration, your doctor may ask you to start moving the joint soon after the procedure. Most likely after surgery, your joint will be splinted for up to seven to 10 days. A splint is a hard wrap that will keep you from moving your joint. Not all physicians agree with this method (see below). Recent studies show that splinting for a long period of time doesn't really help, and use of the joint soon after treatment is now often being encouraged by some physicians. Your doctor may ask you to return for a checkup after your surgery and will decide if physical or occupational therapy is needed. Follow-up care will be based on your personal needs. Because the cause of a ganglion cyst is not known, it is difficult to tell how to prevent them. Early evaluation and treatment are recommended. Because some cysts may be triggered to form after trauma or overuse of a joint, avoiding these situations may reduce the risk of cyst formation. Because this is a harmless tumor that can go away on its own, or after a simple needle aspiration or minor surgery, chances are good that you will have a full recovery. Because ganglion cysts may come back after any of these treatments, however, a single treatment may not be enough. Media file 1: A traumatic ganglion cyst. This person came to the emergency department with a painful bump after the wrist was hit by a car door. Media file 2: The jellylike fluid taken from the cyst in image 1. Its presence confirms the diagnosis of a ganglion cyst. 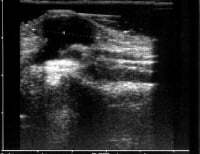 Media file 3: An ultrasound image shows the ganglion cyst (area between markers) from image 1. Media file 4: A ganglion cyst that has been operated on in the past. This ganglion returned because this person plays the cymbals in her school band. Edwards, Scott G., and John A. Johansen. "Prospective Outcomes and Associations of Wrist Ganglion Cysts Resected Arthroscopically." Journal of Hand Surgery 34.3 March 2009: 395-400. Genova, R. "Ganglion Cyst." Medscape.com. Aug. 17, 2015. <http://emedicine.medscape.com/article/1243454-overview>. Lin, Che-Sheng, Tyng-Guey Wang, Jeng-Yi Shieh, and Wen-Shiang Chen. "Accuracy of Sonography in the Diagnosis of Superficial Ganglion Cyst and Lipoma." J Med Ultrasound 17.2 (2009): 107-113. Wong, Andrew S., Peter J.L. Jebson, Peter M. Murray, and Stephen D. Trigg. "The Use of Routine Wrist Radiography Is Not Useful in the Evaluation of Patients with a Ganglion Cyst of the Wrist." Hand 2.3 Sept. 2007: 117-119. Please describe the treatment for your ganglion cyst. What was the cause of your ganglion cyst? What were the symptoms of your ganglion cyst? How was your ganglion cyst diagnosed?